All asparagus is not created equal. Just ask Barbara Cecchini, who brings over 20 years of farming experience to the asparagus operation she runs with her husband, Bob, a third-generation farmer himself. Barbara’s pride in producing top-quality California asparagus is matched only by the pride she feels working alongside her husband, son, daughter and father on the 2,000-acre family farm. She also loves growing asparagus in California’s sunny springtime weather, which she calls “more reliable than most growing areas,” and hopes her enthusiasm is shared by consumers. Well, you heard the lady. When you’re in the market for fresh asparagus, make sure it’s from California — and keep our state’s farmers in the green! There are approximately 250 asparagus growers in California. California produces more than 70 percent of the nation’s fresh market asparagus. The state’s asparagus growers spend nearly $55.6 million annually in California, which creates a ripple effect of overall business activity projected to total nearly $91.4 million annually or about $250,350 each day of the year. According to the National Cancer Institute, asparagus is the highest tested food containing glutathione, one of the body’s most potent cancer fighters. The first documented production of asparagus in California dates back to 1852. Preheat oven to 450°F and line 2 large baking sheets with parchment paper. Heat a very large nonstick skillet over medium-high heat. Add pancetta and cook, stirring frequently, for about 5 minutes or until browned and crisp; remove from skillet using a slotted spoon. Pour grease into a small bowl and add 1 tablespoon back to skillet. Cook potatoes in a single layer for about 5 minutes on each side or until golden brown, cooking in 2 batches if necessary. Remove and add a little more grease to skillet; cook onions for 10 minutes or until very soft. Stir in asparagus and garlic and remove from heat. Divide dough into 3 equal pieces. Roll each into a 10 X 7-inch rectangle on a lightly floured board. Transfer to prepare baking sheets and top with mozzarella. 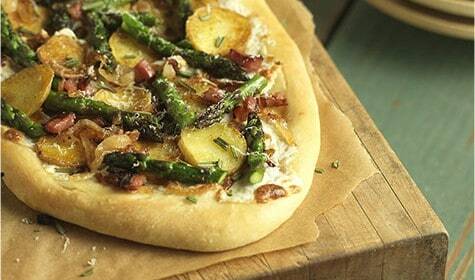 Arrange potatoes and asparagus mixture over cheese. Bake for 12 to 15 minutes or until cheese is lightly browned on the edges. Sprinkle with Parmigiano-Reggiano and fresh rosemary.